edit: Ok, added color, messing with the blend tool. I'm not sure if I like this coloring or not, C&C? Run FREE, gentle Lightning! Run like the wind! Overall, Shpiffy looking... so far, atleast. Wow! You did your line art by mouse? Very well done! I also like how "washed out" it looks. I feels like it came out of a manga. niiice. its really awsome. 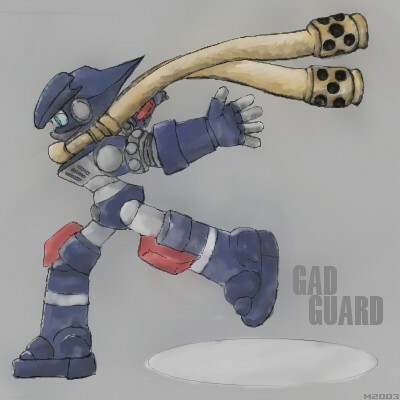 my only thing would be if his front leg is bent, his back leg would probably be bent a bit too.. no big deal, just saying.. say what is gad guard anyways? It's an anime, you can get them at animejunkies. Oh ya, and from what I can tell, there actually isn't any part of the leg that can bend, the only reason I bent the right foot is cause it'd look weird otherwise. I'll have to go back and watch it again and see how they do it. i think the coloring needs a little more contrast to make it look metallic or something, but otherwise good. in the reference picture it doesn't look too shiny either, but using that cell shading style with high contrast looks good. color in this i think is just too washed out. I think it looks cool. Nice coloring. I need to learn that program. Nope, I just drew it. That's reallllll good........... Very Very Good...*nods*...I wish I could draw that!!!! They're actually metal exhaust pipes that can bend...heh. wow, so many questions. Why did you line it with the mouse? Is the anime any good? Anyway, questions aside, I really like it. lined with a mouse cause I was in vizlab, anime is good, yes. haven't watched the whole thing though. Boy I haven't see this in awhile..